An electromagnets is a kind of magnet whose magnetic field is created by the flow of electric current. The magnetic field disappears when the current stops. Electromagnets offer the advantages of controlled holding power and on command release. Through the application of controlled DC electrical current, an electromagnet has the ability to attract and hold ferrous materials with varying degrees of force, and to release the item as required. HSMAG supplies electromagnet in a variety of sizes, shapes and current strengths to meet your end-use requirements. Our technical sales team will work with you to determine what type of electromagnet will best suit your purpose. 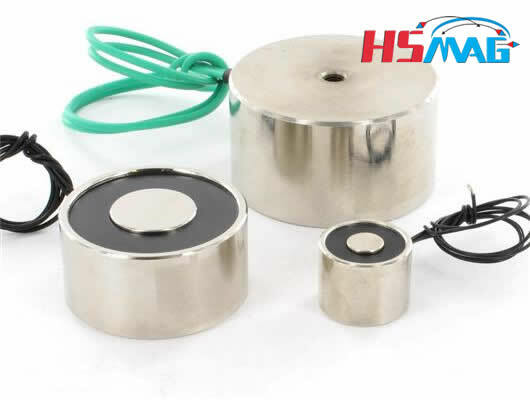 HSMAG’ electromagnet are available in flat-faced round and rectangle form or bi-polar rectangle. Contact us at EMAIL: info@hsmagnets.com, if you don’t see what you’re looking for in this brief listing.